Sega Pass customer datails hacked, LulzSec wants to Help Sega ! Sega has told gamers that some of their personal information may have been stolen following an attack on its systems. E-mail addresses and dates of birth stored on the Sega Pass database were accessed by hackers. But payment information, such as credit card numbers, remained safe as it was handled elsewhere, Sega said . The hacking group Lulz Security appeared to deny involvement, despite leading a wave of recent cyber attacks. "@Sega - contact us. We want to help you destroy the hackers that attacked you. 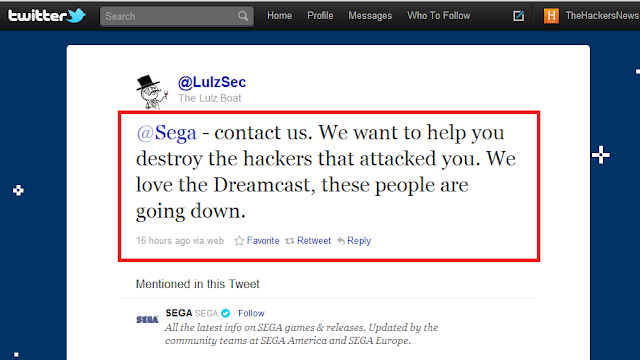 We love the Dreamcast, these people are going down," the hacking group posted on its Twitter feed. No hacker group has claimed responsibility for the attack so far. Although, a number of recent attacks on game companies and their online services are credited with LulzSec, its denial of the credit has brought in a twist of events. "We have identified that a subset of SEGA Pass members' emails addresses, dates of birth and encrypted passwords were obtained," Sega added. "To stress, none of the passwords obtained were stored in plain text."